OUR THIRDCLASS BEGINS TUESDAY, SEPTEMBER 11TH! By the grace of God, dedicated volunteers, and generous donations, we were able to kick off the first FBC Archery Ministry Program September 2016. 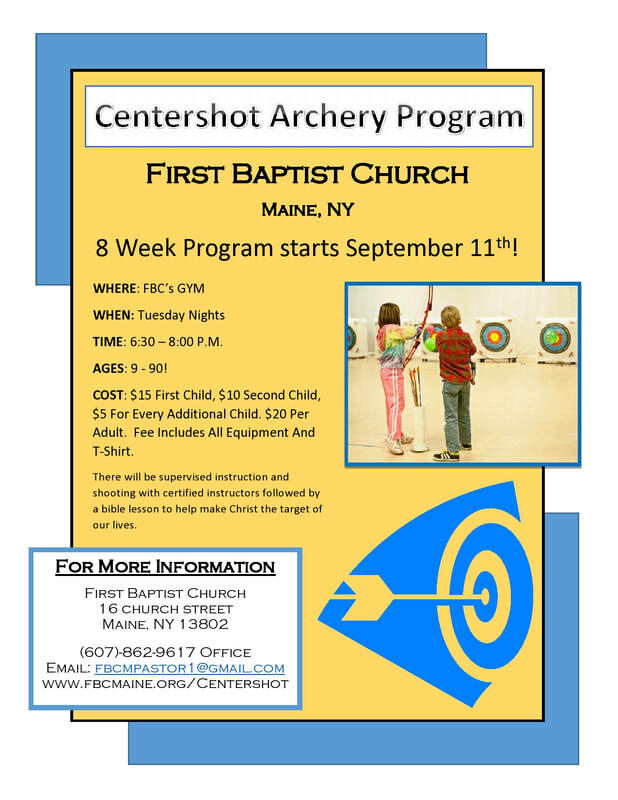 Partnering with Centershot Ministries, this program shares the Gospel of Jesus using the life-skill of archery. Archery instructors will be trained and equipped to use the program as an outreach to the community. The course is designed for all experience levels, but regardless of previous practice, all participants will learn the basic fundamentals of archery through Centershot’s 11-step shooting technique. So even if you’ve never picked up a bow before, you will quickly learn proper form and mechanics to not only execute a great shot, but also to evaluate each shot step-by-step. A short Bible study is incorporated into each week’s archery lesson. Participation is open to ages 9 and up to adults age 90. The 8 week program will run at various times throughout the year. Our second class will start on Tuesday, September 5th and will run for 8 weeks from 6:30-8:00 P.M. The cost will be for children, first Child $15, second child $10, and only $5 for every additional child. The cost is $20 per adult. This will include the use of all equipment and a t-shirt. You can register in the following ways. Download the registration form and fill it out. 1. Mail your registration form along with the appropriate fees to First Baptist Church - P.O. Box 189 Maine, New York 13802. 2. Drop off your registration form along with the appropriate fees to the church office (call first 607-862-9617) to ensure someone is available. 3. Bring your registration form on September 11th along with the appropriate fees to the first class, if space remains. Space is limited so registering early is recommended. * Please make checks payable to First Baptist Church. If you have any questions about this ministry or would like more information, please call the church office at 607-862-9617 or email Pastor Jim at fbcmpastor1@gmail.com.